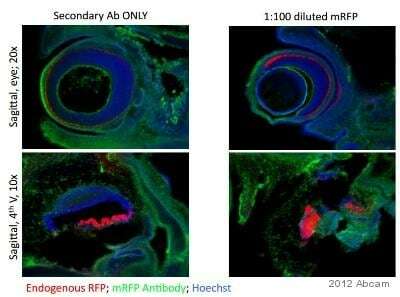 ab109809 recognizes native and denatured forms of red fluorescent protein (RFP). It will also recognize tag-RFP, turbo-RFP, DeRed, mCherry, and mOrange. Synthetic peptide corresponding to RFP conjugated to keyhole limpet haemocyanin. Synthetic peptide conjugated to KLH from the N-terminal of RFP protein from Discosoma anemone. WB: HEK-293T cell lysate transfected with DsRed Expression. Our Abpromise guarantee covers the use of ab109809 in the following tested applications. ab109809 has not yet been referenced specifically in any publications. Publishing research using ab109809? Please let us know so that we can cite the reference in this datasheet.